When i came home from office yesterday, my mother seemed visibly perturbed. She was watching the TV and, just as i came inside, she said 'बघ ना, हे काय होतय दर दहा मिनीटांनी! चार वेळा टीव्ही बंद-चालू करुन झाला!' (Look at what has happened to the television, I've tried switching it on-n-off four times already). Our set-top box was having a firmware upgrade! NDS is a big company which specializes in CAS and digital TV solutions. Although my mother could read and understand the message saying 'do not interrupt power during this process' she did obviously did not care. 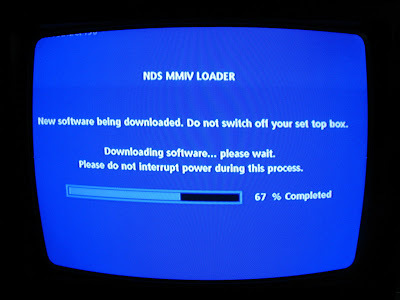 Why should a TV viewer be missing his/her programme because the device decided to upgrade itself ? In general, end-users should not be bothered about technicalities of everyday devices. In this case, my set-top box showed up this screen every ten minutes or so. Even after interrupting a couple of times, it continued to happen. Ideally, the programmer should have asked the user whether he wants to proceed with the upgrade right now. The box and its remote control definitely have the capability to display and handle a yes-no dialog box. One good thing the programmer had done was that even if the process was interrupted, nothing bad seemed to happen. Ultimately, out of the fear of bricking the box, I convinced my mom to let the box complete the upgrade. Fortunately, my mom is not addicted to any of those (horrible) daily soaps. She is only interested in news and Marathi music programmes. So, convincing her to was very easy. After the upgrade was done 100%, the box rebooted. I could spot some UI changes which they brought into the upgrade - a useful one was related to displaying the audio volume. The channel switching speed also had improved slightly. I experienced similar problem (and on my screen there was no indication of NDS etc., anyway)But then I remembered a that a few days earlier there was a message by cable company saying that software is going to be upgraded at such and such time (it was some time in the night, i think) and users are requested to keep their set-top boxes 'On'.